This does two things. First, it gives Igarashi a chance to either “fix” himself in the minors or slowly fade away and back to Japan. 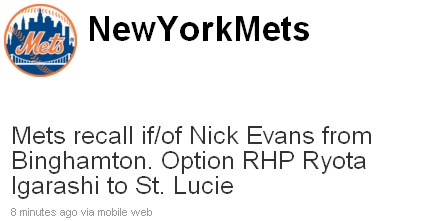 Second, it gives the Mets an opportunity to showcase Nick Evans as trade bait. No MLB team is going to value a 24-year-old who dominates AA pitching but struggled mightily in AAA. But, Evans has been hot, and if he can club a few homers at the MLB level, maybe some team will take notice and consider Evans as a secondary piece in a deal for a journeyman pitcher. The Shane Spencer Effect. what’s not to get? as Joe wrote, Evans was tearing up AA and should have been on the roster all a long in lieu of Tatis. If nothing else he has a brief window to showcase himself for a trade opportunity. Meantime, Igarashi has been nothing short of awful since returning from the DL, and with the all-star break coming up and Takahashi momentarily moving to the bullpen, the Mets could afford to ditch Ryota and still have 7 arms in the pen. more than likely Evans will go to AAA after the break to make room for Beltran, and Thole will go back down to make way for a reliever (my money’s on Acosta).